Their hockey teams may not be able to beat us for the Stanley Cup (and they don't take to losing very well at all), but the Canadians have it all over us when it comes to privately importing cars. We have to wait 25 years for a non-certified car to become legal. The Canadians only have to wait 15. This car is completely legal in Canada. The Chimaera is about as close as you'll get to a TVR that can be driven everyday. It is the most popular TVR ever built. The engine is Rover's ubiquitous aluminum V8. Over the course of its production life in the the TVR Chimaera it was available as a 4.0, 4.3 (super rare), 4.5 and a 5.0 liter engine. This car has the 4.0 version in it. 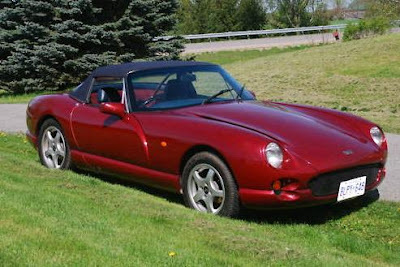 In my eyes the Chimaera one of the nicest looking TVRs ever. It has some really interesting touches... The area surrounding the front turn signal was supposedly created by Peter Wheeler's dog. The story goes that the dog took a bite out of the foam mock-up and Wheeler, liking what he saw, instructed his designers to turn the dog bite into the recess for the turn signal. There are no door handles - inside or out. To get in from the outside, you press a little button that sits on the rear quarter-panel, just behind the door. To get out from the inside, you twist a knob located in the center console. Clockwise opens the right door, counter-clockwise opens the left. 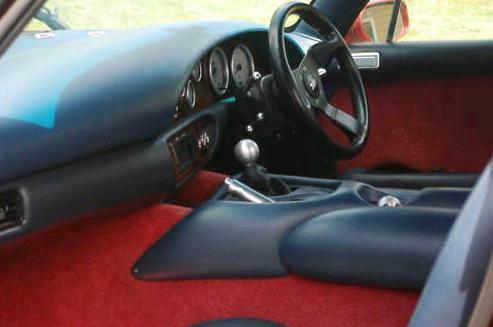 The interior is sparse and features the traditional TVR gigantic transmission tunnel. This Chimaera is in very nice condition. It has 77,000 miles on it and has recently been serviced. The body is fiberglass, so rust isn't a problem there, but the frames are prone to rust and should be checked thoroughly. 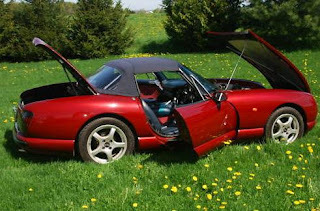 I know that there are people out there who know of ways of getting this car into the US. None of those ways are legal and I don't have the balls to try it. Losing $20,000.00+ and the car is just not a risk I can take. For now I'll have to decide whether I want to wait 10 years to legally own a Chimaera or move to Canada. Located in Orangeville, ON, Canada, click here to see the eBay listing. Very cool interesting car. 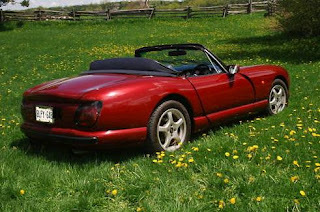 I like the styling and it seems easy to work on with the ford engine. The only disappointment for me is the fiberglass body. I prefer metal around me. More like a kit car in that respect.